Electronic music seems to have one specific, defining characteristic: it must be made on keyboard- or computer-based instruments, not with guitars and drums. The Canadian trio, The New Deal, have decided that&#146;s a little restrictive for their tastes. They do have a keyboardist, Jamie Shields. But they also have a bassist (Dan Kurtz) and a drummer (Darren Shearer). Their music is a mix of trance techno&#146;s highly repetitive note clusters and steady, quick beat with the improvisatory methods of &#147;jam-band&#148; rock acts like Phish. Kurtz and Shearer are an excellent rhythm team, turning on a dime to draw the material in different directions. To succeed with the electronic-music audience, they must imitate a DJ cutting between instrumental techno records, and they do so almost perfectly. They seem to have created an entirely new type of music, rooted as much in jazz&#146;s high-speed interaction as in techno&#146;s endless oceans of sound. The New Deal’s new album is almost entirely instrumental. Only on the opening &#147;Back To The Middle&#148; and &#147;Exciting New Direction&#148; do human voices put in any appearance. As the album begins, a male announcer states &#147;If you&#146;ve got headphones, you better put &#145;em on and get &#145;em cranked up.&#148; It&#146;s good advice, because there&#146;s a lot going on here that a casual listener might miss. The New Deal&#146;s music certainly can be appreciated as just an energy rush; it&#146;s impossible not to tap your foot to their beats, and easy to imagine feeling an almost irresistible pull towards the dance floor. But headphone fans will get off on the polyrhythms and the way the rhythm players lock into each other, often pulling keyboardist Shields (nominally the &#147;lead&#148; instrument) along instead of the other way around. The second voice heard on the disc, on &#147;Exciting New Direction,&#148; is that of a female corporate officer, speaking in the measured tones of money. Her monologue flows throughout the entire track, and only at the very end is it revealed as a phone call received by one band member, telling him he&#146;s been fired. It&#146;s one of the best laughs available in pop music right now. This is not The New Deal&#146;s only release. They&#146;ve got a few self-released CD-Rs that they sell at shows, and Jive has also issued the album tracks &#147;Receiver&#148; and &#147;Exciting New Direction&#148; as an EP, with two additional non-album songs. That&#146;s well worth hearing, too. The band’s reputation is being built in the live context, though. They play between DJs at techno clubs, as well as touring with hippie-ish &#147;jam&#148; bands. They could probably bring this music into the jazz scene, if they so chose. Artists like Tim Hagans and Eric Truffaz have been making excellent records in the past few years, combining electronic sounds with jazz improvisation. 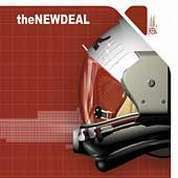 The New Deal are the first band to approach that middle ground from the other side.